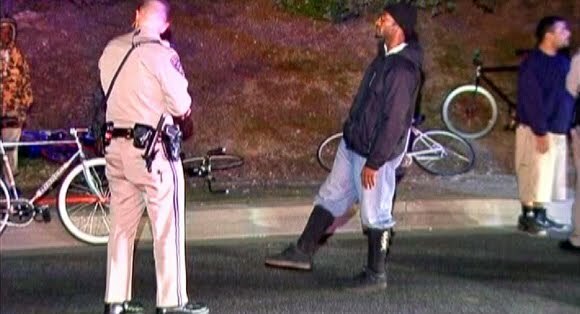 BicycleFriends.com: Bicycle Law - Accidents, Who is at Fault? I found this little bit of information on Findlaw.com regarding bicycle related accidents. Its an interesting read and be careful while riding. The best advise I was ever given was don't assume drivers see you. When possible, at intersections, always try to make eye contact with drivers. "Particularly when they involve an automobile, bicycle accidents can result in serious and sometimes fatal injuries. Lawsuits to recover damages for injuries in bicycle accidents with automobiles involve many of the same issues as any auto accident lawsuit. As with other vehicle accidents, liability for bike accident injuries often comes down to negligence – particularly whether the automobile driver's negligence caused the cyclist's injuries, and whether any negligence by the cyclist caused or contributed to the cause of the accident"
That's solid advice for bikers, especially those who haven't been behind the wheel of a car. A car accident lawyer orlando once told me about how many more cycling accidents occurred over the last few years. I agree with you, I think bikers should not assume that driver's see them. Responsible driving in the road is very important. Accidents happens all the time. That is why it is very important to get an insurance to cover the damages. This is also common among people who drive using their motorcycle. These motorcycle drivers try to get away with the traffic and they try to stay in a narrower side where PUV and private vehicle drivers don't notice them crossing. This is one of the major reasons why many countries create a lane for motorcycles and bicycles only to prevent the increasing fatalities brought by car and motorcycles accidents. To prevent accidents related to bicycles and motorcycles, it is an essential character of an individual to be a responsible driver. Accidents can happen anytime and there is a possibility of serious injuries or even death. Now, who is to be blamed? This needs a trial or a mediation on the other hand. However, if both parties don't agree with settlement, a court trial may resolve the issue. It's really hard for the both parties to know who's really at fault. To better have a clear understanding, there must be proper documents that show clear picture of what really happened. The installed cameras may help. This should be done with the presence of your lawyer to defend you accordingly. Whether you cause the accident or not, it is an imperative not to admit the fault. You need to contact your lawyer first to ensure that everything goes well. Anything you say can be used against you. It is important to talk to your lawyers first before giving any statements. This will give you more time to think. I agree that any statement made by an individual can be used against him. This is true. Everyone should careful while riding in any means of transportation such as bikes, cars, jeepney etc.. The most important, drivers shouldn't influenced by drugs because this is prohibited by law. If this case might be happened there's a defective drugs lawyer that you count in.